In 2007 a new Biomass Energy Centre was constructed at Aboyne Academy in order to meet the Academy’s heating requirements from a source of Sustainable Renewable Energy. A Kohlbach K8 600 600kWth wood chip boiler with an underground fuel store was installed and was commissioned by Aberdeenshire Council in order to help reduce the Carbon Footprint of Aboyne Academy. The site includes an academy, primary school, indoor swimming pool, library, theatre and community centre. Scot Heat & Power Ltd is responsible for the safe and effective operation and maintenance of the Kohlbach K8 600 600kWh Biomass Boiler and all the associated equipment at the Energy Centre supplying Aboyne Academy and the connected Leisure Centre with a source of renewable heating and hot water. 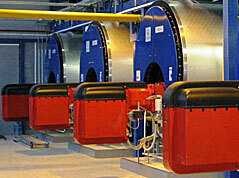 The computerized control system enables the biomass boiler to become the lead boiler to provide heating and hot water to the site and associated buildings. the two existing 1460kW rated oil-fired boilers have remained to act as back-up and to meet the peak demand of the system during the coldest times of the year. The biomass boiler is connected to a 20,000 litre buffer tank in order to react quickly and meet the majority of heat demand for the site. Scot Heat & Power Ltd implement and maintain a robust monitoring system for the performance of our operations to ensure they are being performed as efficiently as possible in order to maximise savings, reduce wastage and reduce the Carbon Footprint of our operations whenever possible. Our wood fuel processing and delivery machinery and vehicle fleet is closely monitored and delivery routes are chosen to maximise carbon savings in the supply chain to maintain the Carbon Neutrality that heating with Biomass Wood Fuel provides. 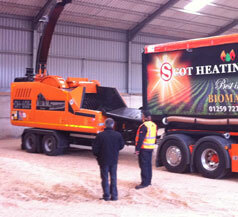 The wood fuel is delivered via a Tipper trailer – one of several in the Scot Heat & Power Ltd fleet – into an underground bunker. the wood fuel is then moved along a walking floor into a feed trough where it is pushed by hydraulic ram into the boiler. system. The KOHLBACH boiler is able to efficiently burn wood fuel up to 60% moisture content and due to the ram stoker feed system can utilize wood fuel of random size. The biomass installation provides Aboyne Academy with approx 2,000MWh of renewable energy which provides an annual Carbon Footprint reduction of approx 600 tonnes of CO2eq. As Biomass is a Carbon Neutral source of energy this provides Aboyne Academy with a 90% reduction in its Carbon Footprint from its heating operations. 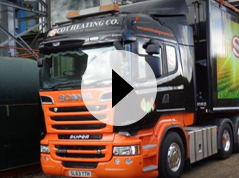 As Scot Heat & Power Ltd are committed to reducing the Carbon Footprint of our operations we monitor our fuel processing and delivery processes in order to minimize the Carbon Footprint of our deliveries from the forest to the boiler. When installed the system has an anticipated payback period of 7 years (based on 2006 energy prices). If installed today the installation would offer a 3-4 year payback based on a combination of energy savings and Renewable Heat Incentive income which would provide approximately £118,000.00 per annum. By installing a Biomass Heating System Aboyne Academy is able to achieve an approximate annual energy saving of £53,000.00 (based on 2015 energy prices) – this is a 30% saving. The installation also allows Aboyne Academy to reduce its payments such as Climate Change Levy charges providing a further saving. 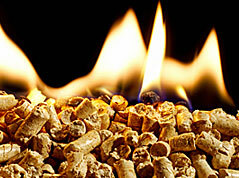 Wood chip is produced and supplied from our local Scot Heat & Power Ltd depot.